Contact center managers and agents can have access to reports in a number of different ways: LCD Screens (wallboards), Desktops, Dashboards, Smartphones, Tablets, Email, Web Reports, Traditional LED Wallboards and printed out in Excel or PDF file format. The challenge is deciding which methods will work best for your contact center. This article is not Best Practices for reporting but rather the selection options for the reporting. When we think about the reporting tool options we have available we are looking for something that will help us solve or reduce our internal problems. It could also be that we just need to provide data to the contact center and are not sure which is best for our business. Positives: These screens are chosen to alert the agents of the contact center overall status as well as business information, product and services, news, weather, traffic and messages. However, what the manager might not consider is agent visibility and daily eye contact with the screen. If the agent cannot see the screen it will not help their productivity or give them the real time status. They may be able to see it when they are walking around but that does not solve the calls waiting problem. Review with all agents whether or not they can actually see the screen. Agents may be able to see the screens but if they work with their heads down most of the day screens are rarely helpful to them. As a manager you are fully aware of what the agents are supposed to be doing on a daily basis and if they are heads down the LCD screen again has little value to them. 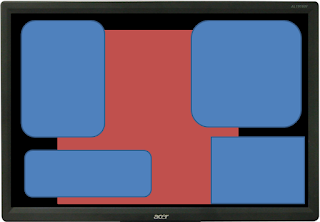 Positives: Having a “wallboard” on an agent desktop is perfect for the agents that cannot see the LCD screens or are always working with their heads down. 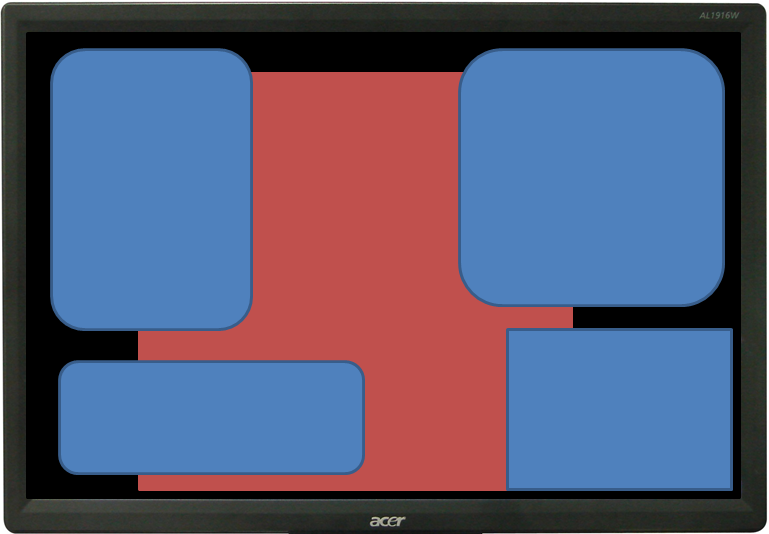 The desktop wallboard can be minimized to the task bar and it will not take up monitor real estate. Desktop alerts are very helpful for agents that need real time status alerts. Real estate can be a conflict between the work the agent is supposed to be doing and having a wallboard pop up and cover over critical information. Or distract the agent when they were being given some key information from the caller. Is the image below an example of what your agents desktop looks like and if so possibly using a desktop wallboard is not the right choice. 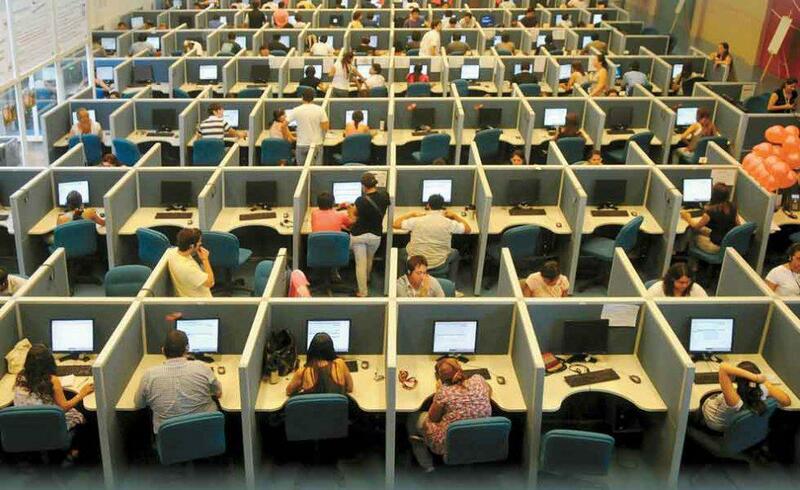 In some call centers agents are often up and away from their desks and will not see any alerts or messages. If the agent is walking about the contact center more than 25% of the time during the day the desktop wallboard loses its value to the agent. Positives: Having data summarized and with multiple tabs of detailed information is very valuable to the manager. The dashboard is available to you on your desktop whenever you need access to that data. Critical data from several different data sources (voice, email, chat, WFM, internal databases) are combined together to give you the data you need in one report and not multiple reports. Many managers need to be mobile. They work remote, or have meetings, travel, or just are mobile within the contact center. Having critical data on a dashboard that they cannot see is of no value to them. The reports need to be on their smartphone or tablet when they are mobile. Some managers take advantage of the LCD screens to see the status but that does not give them information about the agents. The managers also need to see agent productivity in both real time and historical. The manager that is very mobile may need to have access to reports in multiple ways such as a dashboard, LCD screen and web based report. Positives: The mobile manager is aware of the contact center status and productivity because they see that information on their smartphone and tablets. When in a senior level meeting and questioned about the contact center the manager has immediate access to the data and can support the contact center effort and production. Managers that are not mobile do not have a need for this type of reporting. They have access to that data at their desk. Their senior level meetings do not require immediate real time status of the contact center but rather a historical overview of the productivity. Positives: Daily, weekly or when an immediate alert is needed an email is sent out to the notification list making people aware of the situation or providing them with the reports they are expecting. 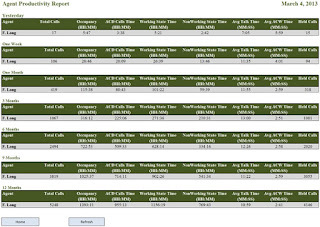 Being mobile or not having access to the dashboard reporting option the email of the daily or weekly report gives the manager the contact center update. The reporting system can also alert the manager when schedules are not being adhered to or the IT department when data is no longer being collected. 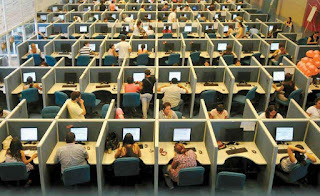 There are many email options available to the contact center team. Managers that are not mobile and have access to the dashboard do not require an emailed report. The IT department that is following the contact center are probably already aware of the data collection problems and do not need to be alerted to the potential problem. Positives: Mobility and historical data for the groups and agents are two key benefits to the web based reporting. Managers that are mobile and need real time summarized data that they can drill down on and see historical group and agent level data are taken care of with the web reporting. Managers are able to see the data on their smartphones and tablets as long as they have remote access to the server managing the web based report. This same report can be seen from home or even from a public PC if the manager has the authorization to the report and gets passed the security. 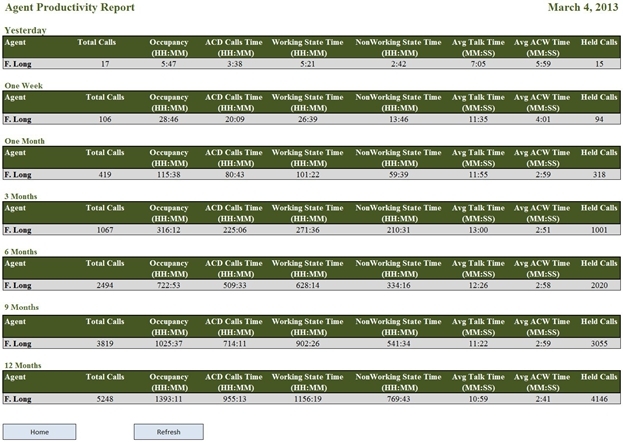 Managers for a smaller contact center usually do not require this type of data. If there is no purpose in your contact center management for historical or remote access then web based reporting is of no value to you. Positives: Most of us think of these wallboards as antiques that do not provide me with the information I am looking for or the data is text only and has very little value. However there are still many systems that support the traditional wallboards and many contact centers that want text only wallboards for the agents. 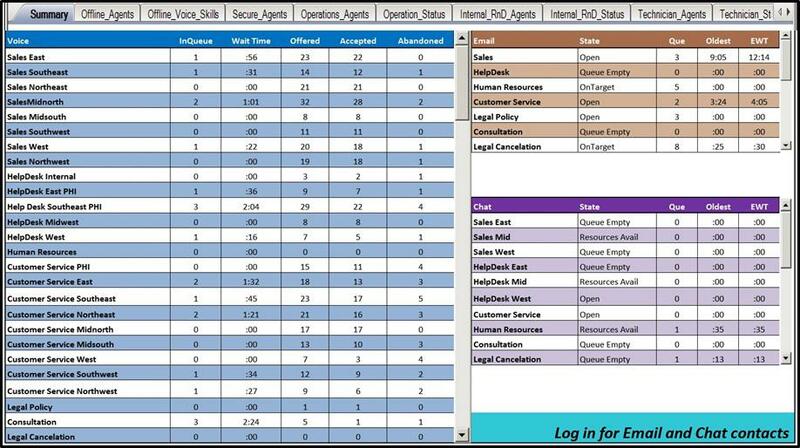 If your call center audience needs to see beyond the statistics then the wallboard will not work for you. Agents that should be aware of new products, services, business information or trends in graphs and charts the traditional wallboard will not work for your contact center. Positives: Data that is in an Excel file can be manipulated by the manager to provide them with the data the reporting system could not provide. 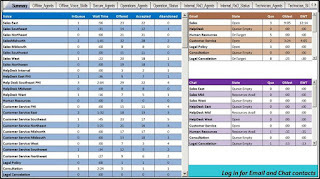 Combining data, new formulas or sorting of the data gives the manager the data they need to manage the contact center. The reporting software should give the manager the option to work on the report in an Excel file format. Then be able to forward or print that report to be used for future references such as trending. If your reporting solution already offers complete information on your dashboard or web report having the file format may not be a requirement for your contact center. There are many options for reporting and selecting the right reporting option can be challenging. The best step is to highlight the problems that the contact center is facing and that you are trying to resolve. Then taking a step back and talking to the audience of the reporting tool options and find out what is going to work for them. Sometimes we overlook the obvious and make quick decisions on solutions to our problems.